Before my first child was born, I naively thought that all cribs were essentially the same and didn’t understand the fuss surrounding picking one out. I quickly learned that not all cribs are created equal, and there are some specific things to look for, especially when it comes to safety. After extensive research, I gathered the safety guidelines every parent should know and came up with some top recommendations for cribs whether you are at home or traveling so you can sleep soundly knowing your little one is safe. Safety standards for cribs were revised in 2011 by the U.S. Consumer Product Safety Commission (CPSC) to make all manufactured cribs safer and sturdier according to the regulations of the American Society for Testing and Materials (ASTM). Since then, anything certified by the Juvenile Products Manufacturers (JPMA) has used these guidelines. The changes included requirements for stronger mattress supports and crib slats, durable crib hardware, rigorous safety testing, and no drop-side cribs. When purchasing a crib, check for these safety certifications to ensure that your crib meets the latest requirements. These are simple, sturdy cribs that are typically easy to put together. They are generally well constructed and long lasting, as well as inexpensive. As with the other crib types, the mattress can adjust to different heights, but the crib as a whole won’t move easily from room to room and can be used only as a crib. These cribs are actually becoming more difficult to find, as most cribs can be converted into at least a daybed. 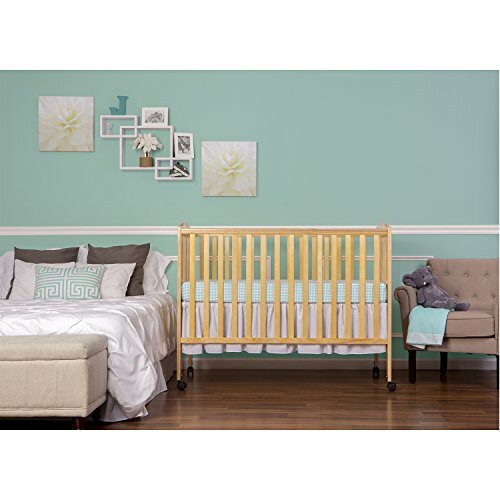 These are long-lasting cribs that can be used as a standard crib, then potentially adapted as a toddler bed with a guardrail, a daybed with one open side, or even as a full-size bed with the long front and back railings of the crib becoming the headboard and footboard (the side rails are usually sold separately). Because these cribs are meant to be used for a long time, they are generally made with very sturdy, long-lasting materials (such as real wood). They may be more expensive than other types of cribs, but the long-term investment makes them a good value for the money. The other consideration is that styles and trends (and tastes) may change over time, so you may want to choose something neutral rather than bright, trendy colors. Also known as folding cribs, portable cribs fold in on the sides so they can be collapsed and stored easily, and they are particularly used by daycare centers and hotels. They have wheels and are easy to move from room to room. Theoretically, this means you can keep an eye on your baby throughout the day as you move the crib to where you are, though this won’t work as well if your house has multiple levels. You’ll also need to consider what type of flooring you have, as some wheels work better on carpet versus hardwood floors, and be sure to check the locks on the wheels regularly to make sure they are working correctly. We’ve collected our top recommendations for cribs based on safety and quality. We discovered that most standard-size cribs on the market can at least convert to a daybed, making convertible cribs far more common than standard cribs. Convertible cribs are also more highly rated because they are made to last a long time, so all the cribs on our recommended list ended up being convertible cribs rather than standard ones. We also have three portable cribs to take a look at if you need something that can be stored or moved easily. However, keep in mind that if you don’t have those specific needs, a convertible crib will be sturdier and last longer, so we generally recommend those over collapsible cribs. As you consider which crib is right for you, don’t forget to take into account how much space you have for this rather large piece of furniture. The standard crib size is 52 x 27.8 inches, but models can vary by several inches, both smaller and larger. You’ll also need to consider what your price range is. You can find cribs that are much more expensive than the ones listed here, as well as cribs that cost much less. These represent a pretty average range as far as cost goes, but keep in mind that as long as a crib meets all the basic safety guidelines, you can find something at a price you can afford. Dimensions 54.3 x 35 x 42 in. 54.2 x 33 x 43 in. 54 x 29.75 x 35 in. Weight 56 lbs. 80 lbs. 54 lbs. Child weight limit 50 lbs. 50 lbs. 50 lbs. 54.3 x 35 x 42 in. 54.2 x 33 x 43 in. 54 x 29.75 x 35 in. 56 lbs. 80 lbs. 54 lbs. 50 lbs. 50 lbs. 50 lbs. Our #1 recommendation is the highly rated and recommended DaVinci Kalani 4-in-1 Convertible Crib. It meets or exceeds all of the necessary safety requirements, contains only non-toxic materials, and is made from sustainable New Zealand pine wood. As a 4-in-1 crib, it can be converted from a crib with four mattress settings into a toddler bed (conversion kit included), daybed, or full-size bed (rails must be purchased separately), and you have seven color options to choose from. It is lighter than some other crib options, though still solidly built. 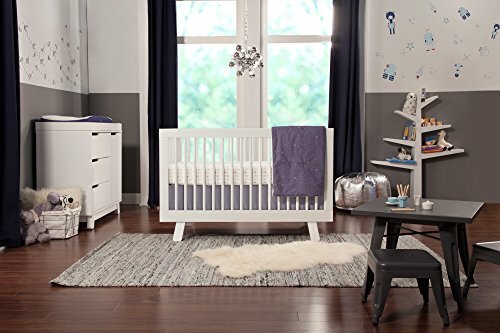 More than three-quarters of over a thousand reviews are positive and many parents mentioned the sturdiness of the crib, the appealing design, and the number of adjustable settings; however, please note that the main complaint we found was that the wood may dent or scratch easily. This is a less expensive option for a high-quality crib and would be an excellent choice. The Storkcraft Tuscany crib is another very popular convertible crib option with similarly good reviews. 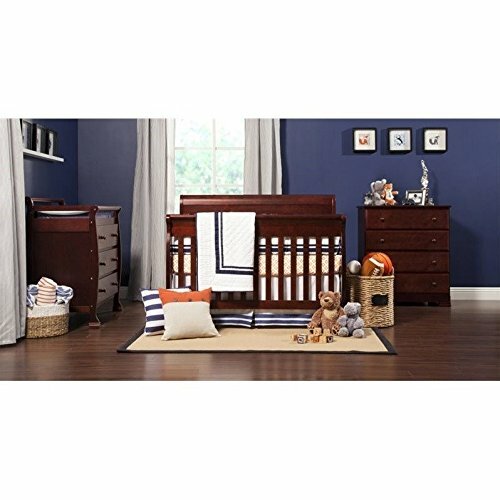 Many of the reviews focused on how easy it was to set up this crib, as well as the quality of the materials and overall look. It is solidly made with non-toxic materials and meets all of the safety requirements. It can be converted from a crib with three mattress settings all the way up to a full-size bed, though the bed rails must be purchased separately, so this is a long-term investment. It is very solidly built from cherry wood, though that means it is also the heaviest crib on our list and won’t be moved around a room easily. 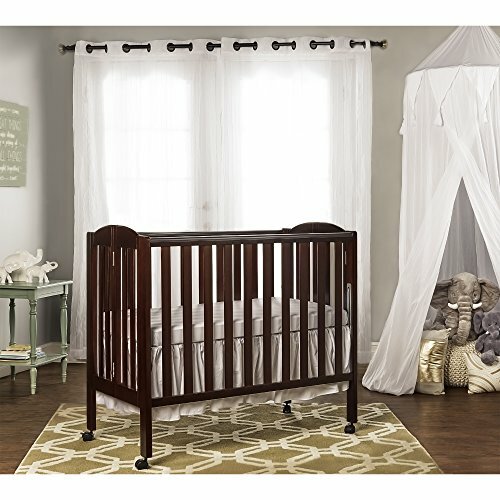 The Storkcraft Tuscany crib is an excellent crib and is the equal of our #1 choice, the DaVinci Kalani, in many ways, but the higher price knocked it down to the #2 spot on our list. The Babyletto Hudson crib is a functional and stylishly modern option, especially for eco-conscious parents. It is made with 100% organic materials with sustainable New Zealand pine wood, and it comes in seven color combination options (solid or two-tone). It can convert from a crib to a toddler bed (toddler bed conversion kit included) to a daybed, and there are four mattress level heights for the crib. It is a more expensive option than our other recommendations, which bumped it down to the #3 slot, and it is also slightly smaller than many other standard cribs, so a mattress of a different brand may not fit well. 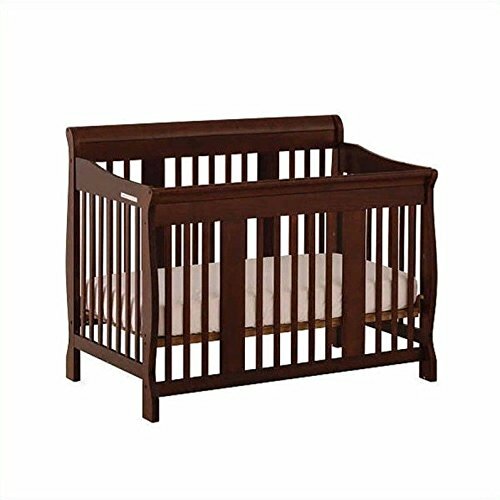 However, the Babyletto Hudson is a high-quality product that has 95% positive reviews of almost 250 on Amazon, with similar results from other online retailers, that focus on the stylish look of the crib and how sturdy it is. This crib meets all the necessary safety standards and will last your family a long time. If you have limited space in your home for a crib, if you need a crib for a second home, or if you want to be able to store your crib easily, you may want to consider a portable or folding crib. Many portable cribs are a smaller than the standard crib size, and most have a lower child weight limit than standard cribs, so they can’t be used for the same child for as long as a convertible or even a standard crib. The shorter sides of a portable crib fold in to collapse the crib and store it very compactly, but keep in mind the mattress will need to be stored as well. There are few extra safety measures that need to be taken with portable cribs, which is why we generally recommend convertible cribs over collapsible cribs. However, if a portable crib is what fits your family’s needs, be sure the folding sides are completely locked in place before putting the mattress board and mattress back in, and be sure to check the locks on the wheels frequently. Dimensions 41 x 26 x 40 in. 54 x 31 x 46 in. 39 x 25 x 37.25 in. Weight 32 lbs. 46 lbs. 37.48 lbs. Child weight limit 35 lbs. 35 lbs. 35 lbs. 41 x 26 x 40 in. 54 x 31 x 46 in. 39 x 25 x 37.25 in. 32 lbs. 46 lbs. 37.48 lbs. 35 lbs. 35 lbs. 35 lbs. The Dream On Me 3-in-1 Folding Portable Crib came in first on our list of portable cribs. It is one of the only portable cribs we found that has three adjustable mattress heights, which is what the “3-in-1” in the name refers to. The highest mattress setting is high enough to use essentially as a bassinet or even changing table, with the lower settings appropriate for slightly older, more mobile babies. 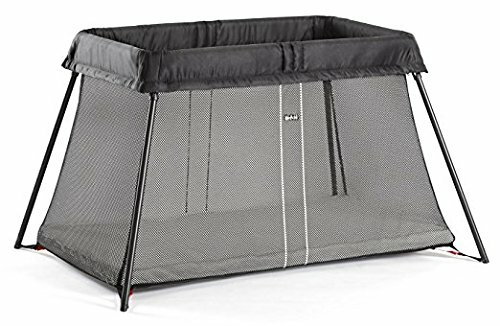 As with most portable cribs, this is smaller and lighter than a standard crib, with a child weight limit of only 35 lbs, and it folds up compactly for storing. A lot of parents who purchased the crib recommend getting a separate 2- or 3-inch mattress to replace the thin pad the crib comes with. It is inexpensive compared to many other cribs and meets all of the required safety guidelines—including locking wheels—to make it an excellent option for parents who need something portable for their new baby. Holds a child only up to 35 lbs. Also from Dream On Me, the Folding Full Size Crib earned our #2 spot for portable cribs. Both its greatest advantage and drawback are that it is a standard crib size instead of a mini crib size. On the one hand, your child will have more room and you can use a standard size mattress and bedding. On the other hand, it won’t save you any space when it’s assembled and it is heavier, making it more difficult to move. However, several parents reported that it is not any more difficult to collapse than a smaller folding crib. There are two adjustable mattress heights, and all four wheels lock securely. Please note the child weight limit is the same as other, smaller portable cribs at only 35 lbs. As with all Dream On Me products, the Folding Full Size Crib meets the highest standards for crib safety and would be a great choice for a second crib that doesn’t need to move too frequently. Our third pick is the Delta Portable Crib, which is also smaller than the standard crib size with a child weight limit of only 35 lbs. 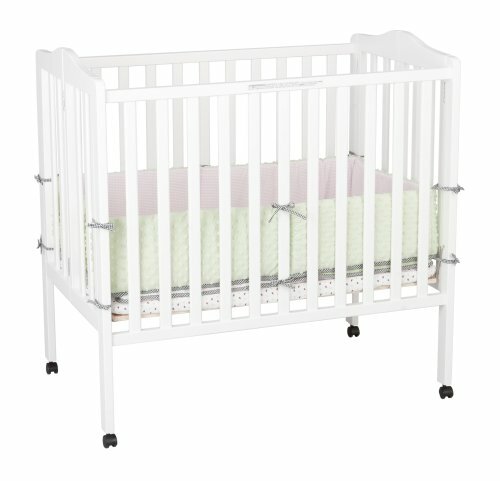 It is a lightweight crib with two adjustable mattress heights, and all four legs have caster wheels; however, the wheels do not lock so you may want to replace them with wheels that do. When folded up to be stored, the crib is only about six inches deep. The number one complaint we found was regarding the thin mattress that comes with the crib. Most parents said it was too thin and flimsy; many purchased a higher-quality mattress separately, and some reported having a difficult time finding one that fit correctly. In spite of that, most reviews positively commented on the ease of setup, the compact storage size, and how easy it is to move from room to room. It is a great option if you’re looking for a mini portable crib. Child weight limit is 35 lbs. In addition to buying a standard-size crib for your home, you may want to find a travel crib for when you are away from home. Travel cribs are smaller, lightweight, and easy to carry. They are collapsible and quick to set up, and most of them can double as a playpen. They are not extremely sturdy and are not suitable as a full-time crib, but they work wonderfully when you’re on the road. There are a few safety standards to look for when choosing a travel crib. Look for mesh sides with holes that are less than 1/4 inch in size (smaller than the tiny buttons on a baby’s clothing). The mesh should be securely attached at the top and bottom without rips, holes, or loose threads. The top rail shouldn’t have holes or tears, either, and all of the rails should lock securely. As you’re choosing a travel crib, take into consideration both your price range and how frequently you’ll be using it. If you do a lot of traveling, you’ll want something that’s especially easy to pack up and transport. If you need it for occasional use at a second location (like grandma’s house), that won’t be as important. The Lotus Everywhere Crib is a high-quality, lightweight portable crib that is ideal for families that travel a lot. The Lotus folds easily into a carrying bag with backpack straps and sets up easily in under a minute. It also meets the highest certifications for safety and non-toxic materials. It does not come with any extra attachments, though there is a bassinet conversion kit that can be purchased separately. There is no weight limit as the bottom of the crib rests directly on the floor. The cover is machine washable, and it has a zippered side door for ease of accessing your baby. That feature, plus its slightly lower price than some of its competition, is what earned the Lotus our #1 spot over our other recommendations. When it comes to ease of setting up, it doesn’t get much better than the Baby Bjorn Travel Crib Light: simply pull the lightweight crib out of its carrying bag, and it will spring open on its own. The compact folded size and ease of set-up make this an excellent choice for families that travel. Baby Bjorn is known for making high-quality baby gear, and the Travel Crib Light is no exception. The crib meets all the highest safest standards and is made of non-toxic materials. 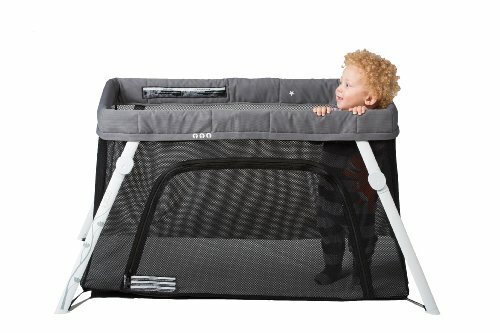 As a bonus, the cover is also machine washable, and the crib rests directly on the ground so there’s no weight limit. The high price tag bumped the Baby Bjorn Travel Crib Light down to our #2 spot, but it is an all-around high-quality pick. Graco is synonymous with baby gear, and while it is not a high-end brand, it is a respectable choice at a much lower price point than many competitors. The Graco Pack ‘n Play On the Go Playard is a popular option for travel cribs, and, as the name suggests, doubles as a playard for your child. It comes with a changing table that fits the length of the playard. 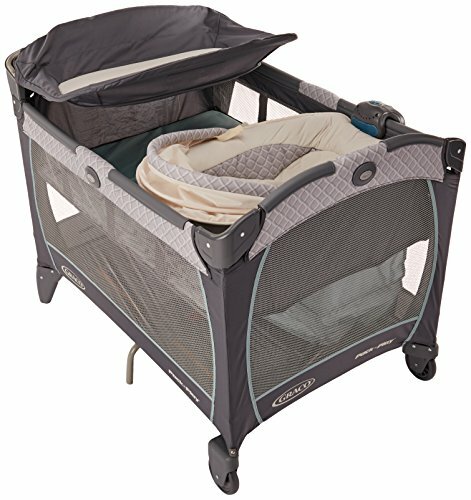 It is both heavier and more cumbersome to set up than the other travel cribs on our list, as the top rails have to be locked individually and in a specific order, but it is also much less expensive, making it a great option for parents who need a portable crib that can stay in one place (for example, at grandma’s house) rather than being packed up frequently. As a general rule, don’t use cribs that are more than ten years old or have been broken or modified in any way. Mattress—The mattress should be no more than 6 inches tall and should fit snugly inside the crib. If you can fit more than two fingers between the crib sides and the mattress, that is an unsafe gap. The danger is that babies could roll or scoot to the side of the crib and get trapped in the gap. Slat distance—Slats should be no more than 2 3/8″ apart to prevent babies from getting their heads stuck between the bars. Corner posts—The corner posts should be no more than 1/16 inch higher than the end panels and no more than 16 inches tall. The concern is that if the posts are higher, a child’s clothing could get caught on them and cause injury. Quality materials—All of the crib materials should be non-toxic, as in no lead-based paint, and there should be no cracked or peeling paint. (If you have a concern, you can purchase a home testing kit for lead paint for under $20.) There should also be no cracks or splits in the wood and no sharp or rough hardware edges. Decorative cutouts—There should not be any cutouts in the head or foot board so a baby’s head or other body parts cannot get trapped. Wheels—If the crib has wheels, they should ideally be caster wheels in order to provide additional stability, and they should lock securely when you’re not moving the crib. Drop-side cribs—No drop-side cribs, period. Between 2005 and 2010, there were 11 recalls involving more than 7 million drop-side cribs due to over two dozen deaths between 2000 and 2010 associated with the drop-side attachments. The problems occurred when the drop-side attachments broke, were poorly repaired, or weren’t put together properly to begin with. Although these types of cribs are no longer manufactured, it’s important to know about them because many are still being used and you may run into them at yard sales or as hand-me-downs from well-meaning family or friends. With any crib, but especially with a used one, be sure to check that all the parts and pieces are there and in working condition, as well as the instructions. Assembling the crib properly and according to the instructions is essential. Also check for any recall information for that crib brand and don’t use any crib that doesn’t meet these safety standards. Clear the area around the crib. Make sure there are no blinds or baby monitor cords that your child could reach from inside the crib, and move the crib away from windows in general. Remove any soft bedding like pillows or thick blankets from the crib to avoid the chance of suffocation. Make sure crib sheets fit snugly and securely on the mattress, and use a firm mattress (no water beds, cushions, or pillows). If you want to use a crib bumper around the sides, use a breathable mesh one, not a thick padded one. Experts also recommend placing babies on their backs while they sleep without using sleep positioners. Consider adding teething bumpers or rails to the sides of the crib. Once your child can stand up, the crib sides will probably be chewed on, and you don’t want any wood splinters in your baby’s mouth. Purchasing a crib is a big investment, especially when you’re trying to plan for your first baby. There are lots (and lots) of choices to make about the size, style, type, and color of your crib, but the most important things to keep in mind are the safety guidelines that will put you at ease while your baby is sleeping. Once that is checked off, it’s really just a matter of finding something that fits your budget and preferences. All of our top picks on this list are safe, solid choices to consider as you plan and prepare for your new baby.